Jingle Smells! Fantastic Festive Fragrances - Super Spicy Seasonal Cinnamon. - Amphora Aromatics Ltd – Supplier of pure essential oils and aromatherapy Products. Jingle Smells! 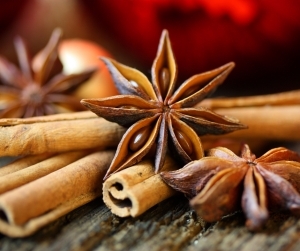 Fantastic Festive Fragrances - Super Spicy Seasonal Cinnamon. Jingle Smells! Fantastic Festive Fragrances - Super Spicy Seasonal Cinnamon! Click for tips and suggestions for this classic Christmas oil. If I had to choose a single scent to represent Christmas then I would have to go with Cinnamon. It seems ironic given that the spice originates from the tropical climate of Sri Lanka but it's definitely become a highly significant scent during the festive season. Its sweet and spicy aroma is truly uplifting and promotes feelings of joy and happiness. It's often used to flavor mulled wine, mince pies and other Christmas desserts. It’s also a very popular scent which is used in Christmas themed candles and man-made synthetic fragrances. But why use synthetic fragrances when you can use the real thing! Diffusing pure essential oil of Cinnamon through your home will not only create a lovely, warm, festive atmosphere, but its disinfectant properties can help to combat airborne viruses and so help to protect your family and friends during gatherings and get-togethers. It’s also a natural stimulant so will help you to focus and stay alert (this can be really helpful after a Christmas shopping trip or when preparing food for a large party!). A lovely way to naturally scent your house is to create your own simmering pot with natural herbs, spices and essential oils. Simply fill up a pan of water, bring it to the boil and add in your herbs, spices and oils. You could also add some slices of orange or lemon (or a couple of drops of the essential oils) for that extra sweet, citrus scent. As for Cinnamon essential oil, well that will blend beautifully with other festive oils such as Ginger, Nutmeg, Orange and Clove. Try adding 3 drops Tangerine, 2 drops Cinnamon and 1 drop of Ginger to your burner or vaporiser. We’ve burned this lovely blend in the office burner a few times over the last couple of weeks and it’s definitely helped to create a lovely, festive atmosphere! Thanks for reading – don’t forget to have a look at our other blogs too. There’s lots of really useful info, blends and tips. Click here to see our other blogs.